From left to right stand River Valley High Schools Poetry Out Loud placers, third place Rebecca Pierce, second place Kristen Clark and first place, Chevy Barnes. 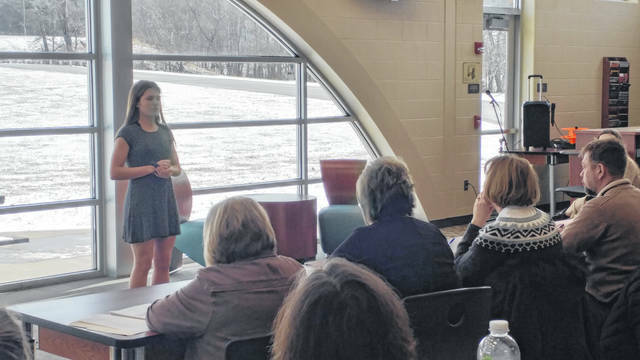 One student displays her poetry and public speaking abilities to judges in the River Valley High School Library. 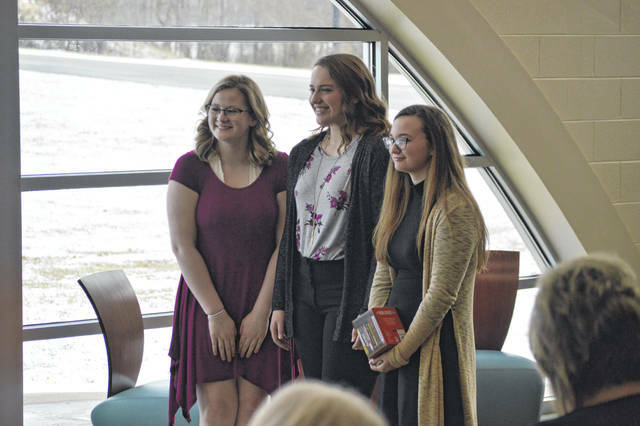 BIDWELL — River Valley High School students took part in a Poetry Out Loud competition Tuesday in the school’s library where three young women will be moving on to the regional competition to be held in Nelsonville at Stuart’s Opera House. The event is set to take place Feb. 9 and serves as a regional competition, with placers moving onto the state competition. Packets featuring the poetry competition material were handed out before Christmas Break and students returned to individual classroom competitions the first day of school. “Based off of that, we felt more was being done with that than what we imagined,” said Cox. She credited colleague teacher Stephanie Campbell with holding practices and working with students as Cox assisted students with recent Mock Trial efforts. Students on Tuesday were judged by Bossard Library Director Debbie Saunders, Gallia County School District Director of Instruction Rochelle Halley, University of Rio Grande Professors Cynthia Graham and Jackson Connor, Rio Dean of the College of Arts and Sciences Heather Duta and Gallia County Schools Board of Education President Beth James.